The most romantic gesture of all: the gift of a unique flower that lasts all year long. This beautiful monoprint features an abstract rose that spills over the sides of the page. This print is totally unique: there will never be another quite like it. Perfect for the art-loving valentine in your life. 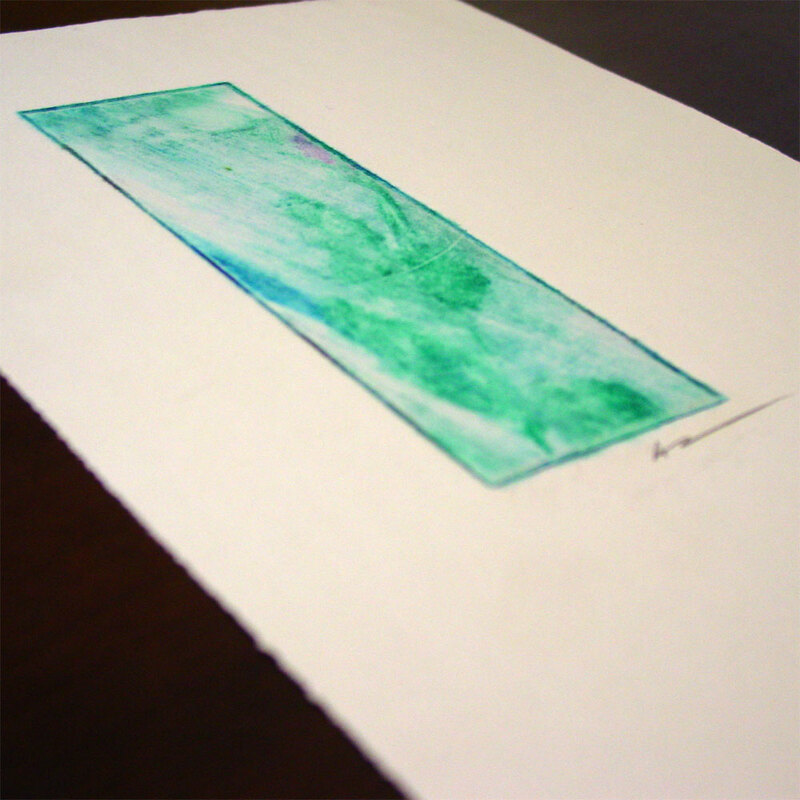 This one-of-a-kind piece of art was created with a unique process called monoprinting. Thick water-based inks are painted onto a blank acrylic printing plate, and then run through a printing press to transfer them to thick archival paper. It’s very similar to the way an etching is hand-pulled, but in this case there is only one copy created, since the original painting vanishes when the inks transfer to the paper. The process is a mix of deliberate art and random elements, since a measure of the texture is lost when the wet paper contacts the water-based inks, absorbing them in a slightly different manner every time. The printing plate in this case was 2″x6″, printed onto a larger 8″x11″ sheet of paper. The second photo shows the way the plate was framed, to draw the viewer’s eye and imagination toward the place where the rose exits the image, allowing them to fill in the rest of the rosebud, to conjure their own image what exists beyond the tiny slice of sky and leaf and stem. Romantic Gesture, monoprint on watercolor paper, 8″x11″, $399 with free shipping. This print is on watercolor paper but will require framing or matting to be suitable for display. I’m happy to frame it for you for a small additional fee.